It’s been almost three years since director James Wan scared the pants off of audiences with The Conjuring. Ever since fans have been waiting with bated breath for the sequel, and the spinoff Annabelle did little to satisfy their thirst for suspenseful scares. Well, the wait is over; The Conjuring 2 is here. After an opening sequence that recaps the Amityville haunting (which was alluded to at the end of The Conjuring), The Conjuring 2 shifts its focus to the Hodgson family in North London, England. The Hodgson girls, Janet and Margaret (Madison Wolfe and Lauren Esposito, respectively), play with a homemade Ouija board and are able to summon a spirit. When their mother, Peggy (Francis O’Connor) finds out, she throws the thing away, but it’s too late; the spirit seems to have already manifested itself in the Hodgson home and is concentrating its bad vibrations on little Janet. After the story gains national attention as the focus of a television news report, Peggy turns to the Church for help, who in turn brings in superhero paranormal investigators Ed and Lorraine Warren (Patrick Wilson and Vera Farmiga reprising their The Conjuring roles). Working with the British TV investigators, Ed and Lorraine research the haunting and try to come up with a way to rid The Hodgsons of the supernatural presence, but Lorraine ends up with a threatening manifestation of her own. James Wan wrote the script for The Conjuring 2 along with his Aquaman scribe, David Johnson, and his The Conjuring screenwriters, Carey and Chad Hayes. One would think that, with so many cooks in the kitchen, The Conjuring 2 would be a convoluted mess. It’s not. Far from it, actually. Wan seems to have assembled a crack team that knows what he wants and how to deliver it. The Conjuring 2 is pretty much more of The Conjuring, except with British accents. And that’s a good thing; if it’s not broken, don’t fix it. That’s not to say that The Conjuring 2 is without fault. At two hours and fifteen minutes, it’s a little long, and it feels it. The movie has a deliberate slow build (the Warrens don’t even end up in London until the halfway mark), and that part works, but there are obvious extraneous scenes that attempt to humanize the characters, and quite frankly, they fail. Which is another flaw in the movie; the Hodgsons are not as likable as the Perron family is in The Conjuring. 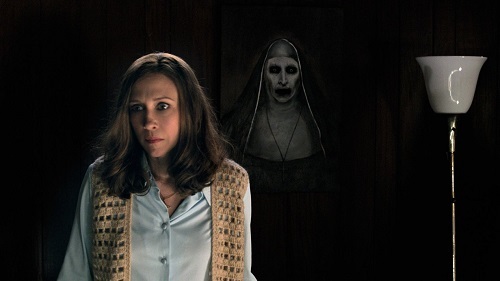 Whereas the audience wanted the Perrons to come out of their ordeal in The Conjuring unscathed, the failure to relate to the characters causes the viewer almost to root for the ghosts in The Conjuring 2. Like The Conjuring (and The Amityville Horror, Annabelle and any other movie made from the Warrens exploits), The Conjuring 2 bears the “true story” stamp. The movie is based on a case in the Warren files called the Enfield Poltergeist. The case is a divisive one, with weighted arguments made for it to be both a genuine haunting and an elaborate hoax, and the movie does acknowledge the skepticism by dividing the British television investigators into two camps (with the Warrens in the middle). But, in the end, it is a movie that exists primarily to sell tickets, so however much of the onscreen action is real or not, it’s all good spooky fun. A comparison of The Conjuring 2 to The Conjuring is inevitable, so here it is: the original is better. But that doesn’t mean that The Conjuring 2 is bad, it’s just a reminder of how great the first one was. The sequel is an impressive entry into a franchise that, because it seems more like an anthology that follows the Warrens around, can keep going and going. The bottom line is that The Conjuring 2 is James Wan doing what James Wan does – scaring the hell out of people. 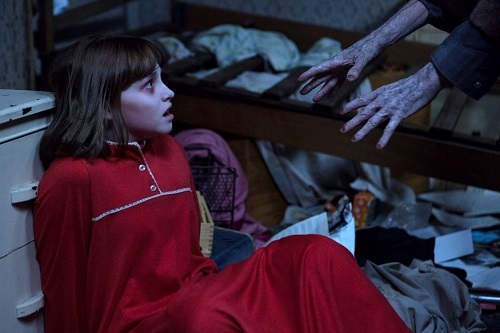 For The Conjuring 2, James Wan enlisted the help of big Hollywood cinematographer Don Burgess, who has shot everything from Forrest Gump and The Muppets to What Lies Beneath and Happy Birthday to Me. Wan and Burgess seem to have an instant connection, as The Conjuring 2 looks as feels very much like a James Wan movie. There is plenty of sweeping, swirling camera motion that not only follows characters but peeps into windows and busts through walls to show the viewer everything that they need to see in long, unbroken takes. Many of the shots are very melodramatic, giving the spooks an otherworldly look (and yes, it’s a plural “spooks” – there are a number of ghosties in the film, played by actors Bob Adrian and Bonnie Aarons, creature performer Javier Botet, and of course, composer Joseph Bishara). Essentially, James Wan puts a lot of information into the photographic frame, forcing the audience to do much of the work. He and Burgess dare the viewer to see the whole picture, and usually, the scary stuff is hiding within the nooks and crannies. James Wan’s movies usually benefit from a second viewing that will allow the audience to soak it all in. The Conjuring 2 is no exception. There is a formula to the James Wan scare. He builds tension with maddening suspense, only to have it go completely silent until the viewer is lulled into a sense of relief, and that’s when he hits them with a loud jump scare. It’s worked for several movies now, and it works in The Conjuring 2, but not quite as well as it has in the past. Maybe audiences have grown used to Wan’s trademark pattern, or maybe he just doesn’t craft the scares well enough, but The Conjuring 2 isn’t as scary as The Conjuring or his Insidious movies. There are still plenty of scares in The Conjuring 2, just not as many as viewers have grown accustomed to having in a James Wan horror movie.